Not Quitting… and a way to help! Day 2 of Steroid treatment: Annabelle slept most of yesterday, and when awake, was horribly cranky. At the moment she is happy, because I have her my “parent” wrist band. She is trying to play with it, but having a hard time since she has an IV in her right hand. She’s trying her best though! Biggest issue today is getting some fluid off, since steroids make her retain water which is NOT good for her breathing status. Still unsure of heart cath date… will probably decide for sure on Friday. Could potentially be as early as 6/9. HOPEFULLY we should be able to go home on Friday though, or that is the plan currently! 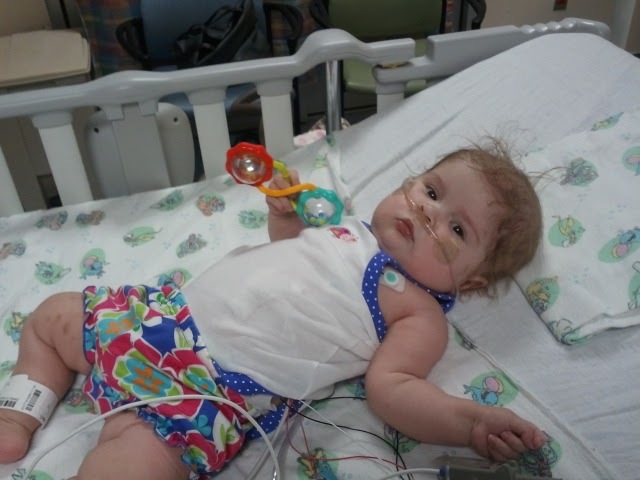 My sister and I were talking on the phone the other day after Annabelle was admitted into the hospital. I was telling her how they feared her body might be rejecting her heart, and we were both just sad, although that seems like the understatement of the century. I smiled, because I’d felt the same thing SO SO SO many times. But this is what I told her, and this is what I feel God has been trying to tell me SO many times, but until I had to explain it to someone else, it didn’t really hit home for me. The only other option is for Annabelle to not be here at all. The fact is, Annabelle was born with a broken heart. They tried to fix it, and it didn’t work. They tried to replace it, and while it worked, she has a lifetime full of medications, possible rejection and retransplant, and other risk factors. This is something she, and all who love her, will ALWAYS have to deal with. It isn’t going away. I’m finding that when I really accept that reality, I can move past my complaining and onto living this new setting of life God has given us. Because Annabelle is TOTALLY worth it. 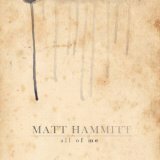 On a similar note, Matt Hammitt, daddy of Bowen (who was born in September with HLHS) and lead singer of Sanctus Real, just debuted a new single yesterday called, All of Me. An amazing song that says no matter the hardship, regardless of the fact that with our little heart babies, we are never promised tomorrow, we are still to love them with OUR whole hearts. Because every single, blessed day is special. Even if you only have your baby for a day, a month, a year, or 80 years. The song also makes me smile, because it is so EXACTLY how I felt when Annabelle was born. She was worth giving my whole-hearted love, and if I should, God-forbid, lose her, every day I have with her is worth the pain later. Matt and his wife Sarah recently started a foundation called the Whole Hearts foundation for families and individuals with congenital heart defects. A portion of the proceeds from the sale of All of Me, as well as the upcoming album it will be on, Every Falling Tear, will be donated to the foundation to help CHD families. You can read more about it on www.bowensheart.com. I just downloaded my copy (from Amazon… you can download the song on iTunes as well), please considering doing the same and spreading the word! It’s a small way you can help… for just 99 cents! Speaking of help, I want to send a BIG thank you to all who have brought meals to our home thus far and have signed up to bring us meals over the next month. Your outpouring of love is so amazing to us! Also, those who have contributed monetarily to our family during this time of uncertainty, it means more than I could ever say. God has truly used your prayers, love and support to uphold us during this time, and we appreciate it so very much! Oh Krista, will be praying. Hugs to you and your family. Do you have a link for the song? I went to purchase it but couldn't find it on iTunes. So sorry to hear you are back in the hospital. Oh how I remember the "no-nos" and the frustration Bean had for not being able to grab things. Your perspective is right on though. This may not be the life we would have chosen, but it is life for our kids! Hang in there! Sending you positive thoughts and prayers! When our Graham was in the hospital, he had one of those frustrating "no-no's" too. And the steroids… well, they were so hard on him because they made him so crazy! Nothing we could do would satisfy him. 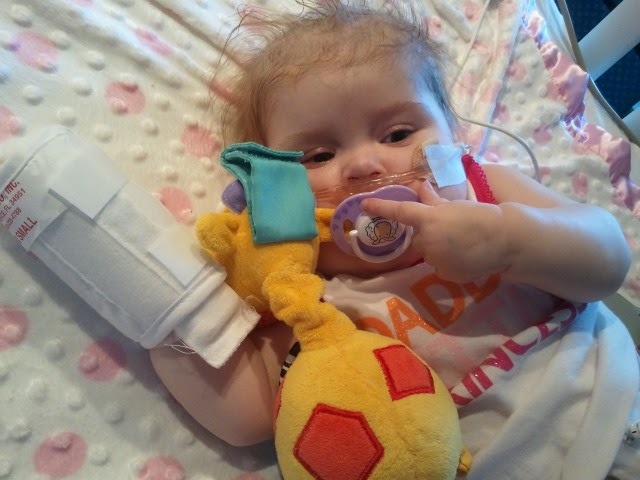 Praying for some rest for all of you and as always, our family is praying for Annabelle! Thanks, Krista. I found the song on iTunes when I went back to look for it a second time. Wonderful lyrics. Still praying for you and your precious Annabelle. I remember feeling the way you do and we haven't been through nearly as much as you have; however, God spoke to me, too. He used a woman's testimony who was facing what she labeled as "the new normal" in her life as her son was sentenced to life in prison. God used her words to change my perspective. Sounds like you have it right and I'll keep praying. She's getting so big! 🙂 You and your family are such an inspiration. Continued prayers being sent your way. Thank you so much for sharing your thoughts and feelings on this long journey you have been on. Your faith in God is such a powerful testimony to so many. Keep leaning on Him and he will get your family through it all. Praying all will go well! It's a good thing you have wonderful nurses and doctors who know what they are doing! Krista, I'm praying for you all. My son and I just prayed for Annabelle. I am so sorry to hear that you are having some complications-I will continue to pray for healing. Yes, Matt's song certainly speaks volumes for us heart parents-he has a wonderful way of using words and music to describe the feelings heart parent has. I am also so grateful that you are able to get some financial help from friends and family-our friends are holding a benefit for our little guy's upcoming surgery. It is so wonderful to see God using people to meet our needs. We serve an awesome and mighty God! I have been reading some "catch up" posts because I had come across your blog awhile back and hadn't kept up for some reason. I saw you on my favorites list and thought, "I wonder how her daughter is doing?" I just wantes to say how I am enjoying reading about your journey and how encouraged I am by your words. It is good for me to be reminded that there are so many others going through similar or even much harder issues than I am facing. I've never spent 9 continuous months in the hospital (though MAYBE if you add all of my sons' hospitalizations it would be close) but I have spent months not going home and feeling overwhelmed and alone at times. My son is now 21. I bet you cannot imagine how fast that goes. He has had several heart surgeries and is now waiting for a heart. sometimes I felt like enough. But you expressed it so well and I want to thank you for sharing your heart and the Word. God's promises are the only thing really worth holding on to and I love when His children are placed in my path and remind me over and over how GOOD He is! Keep sharing and know that even in this God is using you to bring Him praise and glory. Thanks for putting into words what many of us feel but don't have the words to say. I just so related to the not quitting sentiment. I had come to the same comclusion. As long as God gives Andrew life it will be tough here, but if he takes him home it will be tough in another way. I guess we need His grace no matter what. and I guess that's the whole point.